Western blot analysis of extracts from various cell lines using CD38 (E7Z8C) XP® Rabbit mAb (upper) or β-Actin (D6A8) Rabbit mAb #8457 (lower). 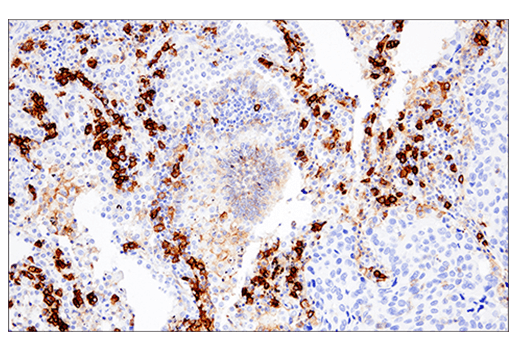 Immunohistochemical analysis of paraffin-embedded human lung adenocarcinoma using CD38 (E7Z8C) XP® Rabbit mAb performed on the Leica® BOND™ Rx. 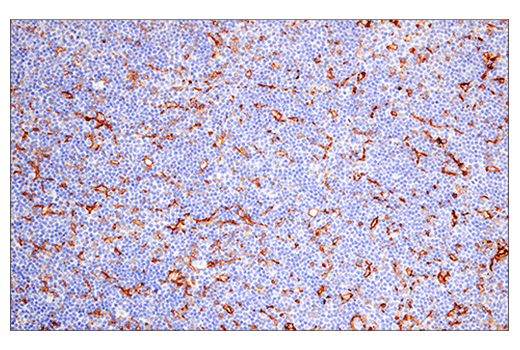 Immunohistochemical analysis of paraffin-embedded human Non-Hodgkin B-cell lymphoma using CD38 (E7Z8C) XP® Rabbit mAb performed on the Leica® BOND™ Rx. 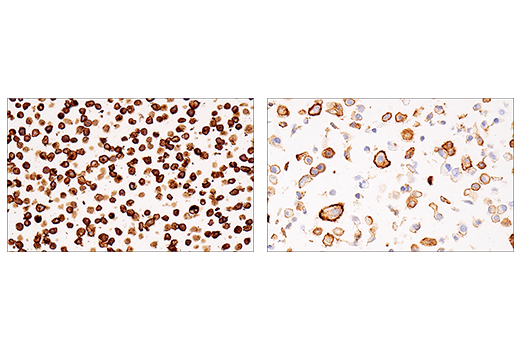 Immunohistochemical analysis of paraffin-embedded Daudi cell pellet (left, high-expressing) or A549 cell pellet (right, low-expressing) using CD38 (E7Z8C) XP® Rabbit mAb. 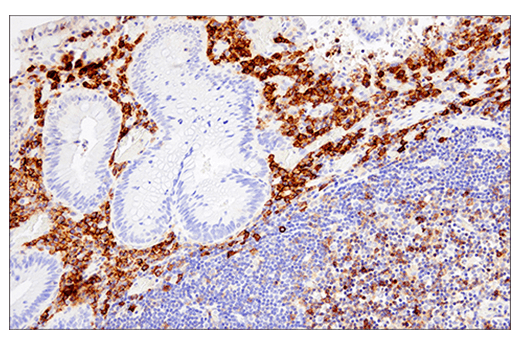 Immunohistochemical analysis of paraffin-embedded human colon carcinoma using CD38 (E7Z8C) XP® Rabbit mAb. Immunohistochemical analysis of paraffin-embedded human adenoid cystic carcinoma of the trachea using CD38 (E7Z8C) XP® Rabbit mAb. 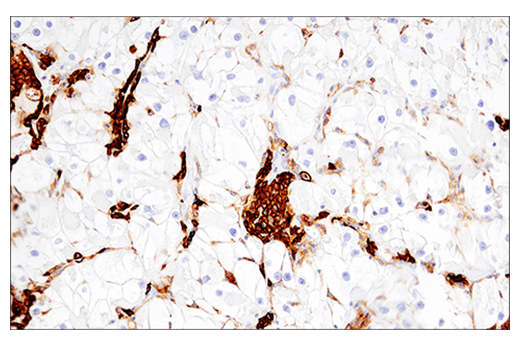 Immunohistochemical analysis of paraffin-embedded human renal cell carcinoma using CD38 (E7Z8C) XP® Rabbit mAb. 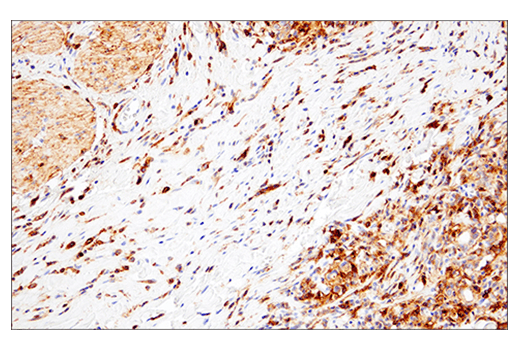 Immunohistochemical analysis of paraffin-embedded human lung adenocarcinoma using CD38 (E7Z8C) XP® Rabbit mAb. 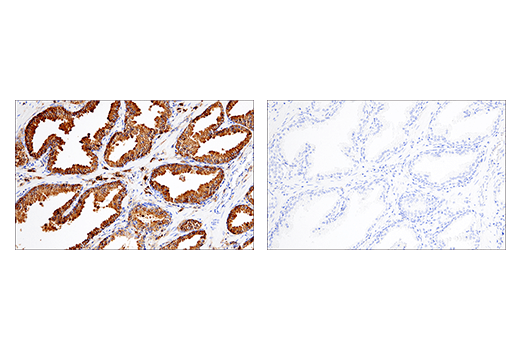 Immunohistochemical analysis of paraffin-embedded human prostate carcinoma using CD38 (E7Z8C) XP® Rabbit mAb (left) compared to concentration matched Rabbit (DA1E) mAb IgG XP® Isotype Control #3900 (right). 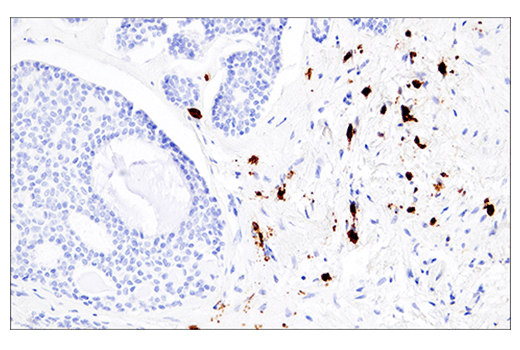 Immunohistochemical analysis of paraffin-embedded human gastric carcinoma using CD38 (E7Z8C) XP® Rabbit mAb. 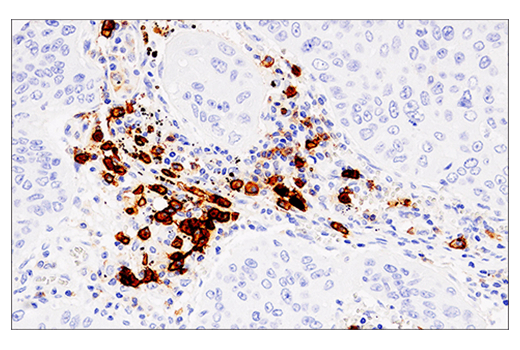 CD38 (E7Z8C) XP® Rabbit mAb recognizes endogenous levels of total CD38 protein. Monoclonal antibody is produced by immunizing animals with a synthetic peptide corresponding to residues surrounding Arg247 of human CD38 protein. Cyclic ADP-ribose hydrolase 1 (CD38) is a transmembrane protein involved in several important biological processes, including immune response, insulin secretion, and social behavior. 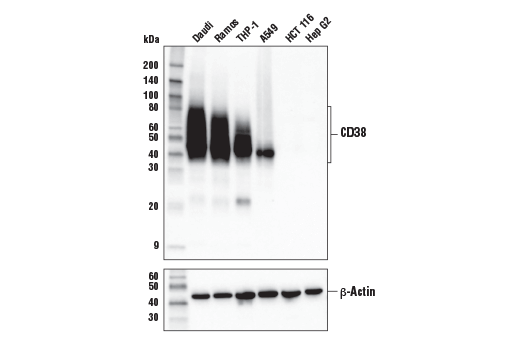 Originally described as a glycosylated immune cell surface marker, additional research determined that CD38 is a multifunctional enzyme that catalyzes the synthesis and hydrolysis of cyclic ADP ribose (cADPR) from NAD (1,2). Under acidic conditions, CD38 also catalyzes the synthesis of nicotinic acid adenine dinucleotide phosphate (NAADP) from NADP+. Both cADPR and NAADP act as calcium ion mobilizing messengers that target different intracellular Ca2+ stores (3-6). Since CD38 is the primary mammalian NAD+ glycohydrolase responsible for NAD+ metabolism, CD38 may be a valuable therapeutic target for treatment of metabolic diseases regulated by NAD+-dependent pathways (7,8). CD38 has also been considered a possible therapeutic target for antibody-mediated therapy for myeloma and chronic lymphocytic leukemia (9-11). Malavasi, F. et al. (2008) Physiol Rev 88, 841-86. Jin, D. et al. (2007) Nature 446, 41-5. Lee, H.C. et al. (1999) Mol Cell Biochem 193, 89-98. Calcraft, P.J. et al. (2009) Nature 459, 596-600. Ogunbayo, O.A. et al. (2011) J Biol Chem 286, 9136-40. Lee, H.C. (2012) J Biol Chem 287, 31633-40. Cantó, C. et al. (2012) Cell Metab 15, 838-47. Escande, C. et al. (2013) Diabetes 62, 1084-93. Malavasi, F. et al. (2011) Blood 118, 3470-8. Deaglio, S. et al. (2010) Semin Cancer Biol 20, 416-23. Chillemi, A. et al. (2013) Mol Med 19, 99-108.